Arrange a bag of Waitrose mixed salad leaves on a serving plate. Halve 8 cherry tomatoes and place on the salad. Cut half a cucumber in half lengthways. Slice and add to the salad. 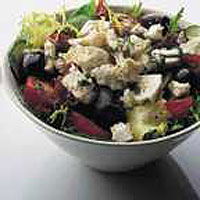 Scatter 115g feta cheese and black olives on top. Make a dressing by combining 4tbsp Waitrose Extra Virgin Olive Oil, 2tbsp lemon juice, 2tbsp chopped fresh mint or oregano, salt and pepper.